1. Wigglesworth, V. B. (1972) The Principles of Insect Physiology, 7th ed., Chapman & Hall, London. 2. Williams, C. M. (1950) The metamorphosis of insects. Sci. Am. 182, 24-28. 3. Bryant, P. J. (1978) Pattern formation in imaginal discs, in The Genetics and Biology of Drosophila, (Ashburner, M. and Wright, T. R. F., eds. ), Academic, New York, Vol. 2C, pp. 229-335. 4. Cohen, S. M. (1993) Imaginal disc development, in The Development of Drosophila melanogaster (Bate, M. and Martinez Arias, A., eds. ), Cold Spring Harbor Laboratory Press, Plainview, NY, Vol. 2, pp. 747-841. 5. Fristrom, D. and Fristrom, J. W. (1993) The metamorphic development of the adult epidermis, in The Development of Drosophila melanogaster (Bate, M. and Martinez Arias, A., eds. ), Cold Spring Harbor Laboratory Press, Plainview, NY, Vol. 2, pp. 843-897. 6. Bodenstein, D. (1950) The postembryonic development of Drosophila, in Biology of Drosophila (Demerec, M., ed. ), Wiley, New York, pp. 275-367. 7. Madhavan, M. M. and Schneiderman, H. A. (1977) Histological analysis of the dynamics of growth of imaginal discs and histoblast nests during the larval development of Drosophila melanogaster. Roux's Arch. Dev. Biol. 183, 269-305. 8. 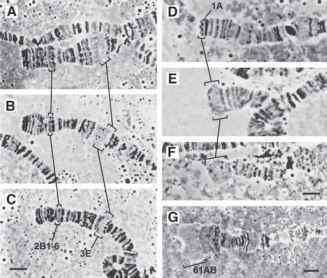 Madhavan, M. M. and Madhavan, K. (1980) Morphogenesis of the epidermis of the adult abdomen of Drosophila. J. Embryol. Exp. Morphol. 60, 1-31. 9. Madhavan, K. and Madhavan, M. M. (1995) Defects in the adult abdominal integument of Drosophila caused by mutations of torpedo, a DER homolog. Roux's Arch. Dev. Biol. 204, 330-335. 10. Roseland, C. and Schneiderman, H. A. (1979) Regulation and metamorphosis of the abdominal histoblasts of Drosophila melanogaster. Roux's Arch. Dev. Biol. 186, 235-265. 11. Madhavan, M. M. and Madhavan, K. (1982) Pattern regulation in tergite of Drosophila: a model. J. Theor. Biol. 95, 731-748. 12. Snodgrass, R. E. (1935) Principles of Insect Morphology, McGraw-Hill, New York. 13. Madhavan, M. M. and Madhavan, K. (1984) Do larval epidermal cells possess the blueprint for adult pattern in Drosophila? J. Embryol. Exp. Morphol. 82, 1-8. 14. Madhavan, K. (1973) Morphogenetic effects of juvenile hormone and juvenile hormone mimics on adult development of Drosophila. J. Insect Physiol. 19, 441-453. 15. Postlethwait, J. H. (1974) Juvenile hormone and the adult development of Drosophila. Biol. Bull. 147, 119-135. 16. Riddiford, L. M. and Ashburner, M. (1991) Role of juvenile hormone in larval development and metamorphosis in Drosophila melanogaster. Gen. Comp. Endocrinol. 82, 172-183. 17. Riddiford, L. M. (1993) Hormones and Drosophila development, in The Development of Drosophila melanogaster (Bate, M. and Martinez Arias, A., eds. ), Cold Spring Harbor Laboratory Press, Plainview, NY, Vol. 2, pp. 899-939. 18. Merriam, J. R. (1978) Estimating primordial cell numbers in Drosophila imaginal discs and histoblasts, in Genetic Mosaics and Cell Differentiation (Gehring, W. J., ed.) Springer-Verlag, New York, pp. 71-96. 19. Shirras, A. D. and Cusso, J. P. (1996) Cell fates in the adult abdomen of Drosophila are determined by wingless during pupal development. Dev. Biol. 175, 24-36. 20. Kopp, A., Blackman, R., and Duncan, I. (1999) Wingless, Decapentaplegic and EGF receptor signaling pathways interact to specify dorso-ventral pattern in the adult abdomen of Drosophila. Development 126, 3495-3507. 21. Kornberg, T. (1981) Compartments in the abdomen of Drosophila and the role of the engrailed locus. Dev. Biol. 86, 363-372. 22. Struhl, G., Barbash, D. A. ,and Lawrence, P. A. (1997a) Hedgehog organizes the pattern and polarity of epidermal cells in the Drosophila abdomen. Development 124, 2143-2154. 23. Struhl, G., Barbash, D. A., and Lawrence, P. A. (1997b) Hedgehog acts by distinct gradient and signal relay mechanisms to organize cell type and cell polarity in the Drosophila abdomen. Development 124, 2155-2165. 24. Kopp, A., Muskavitch, M. A. T., and Duncan, I. (1997) The roles of hedgehog and engrailed in patterning adult abdominal segments of Drosophila. Development 124, 3703-3714. 25. Lawrence, P. A., Casal, J., and Struhl, G. (1999) hedgehog and engrailed: pattern formation and polarity in the Drosophila abdomen. Development 126, 2431-2439. 26. Lawrence, P. A. (2001) Morphogens: how big is the big picture? Nature Cell Biol. 3, E151-154. 27. Ephrussi, B. and Beadle, G. W. (1936) A technique of transplantation for Drosophila. Amer. Naturalist 70, 218-225. 28. Pearse, E, A. G. (1968) Histochemistry: Theoretical and Applied, 3rd ed., Churchill Livingston, London, Vol. 1. 29. Ashburner, M. (1989) Drosophila: A Laboratory Handbook. Cold Spring Harbor Laboratory Press, Cold Spring Harbor, New York.